If you’re a prepper or survivalist, you gotta check this out. 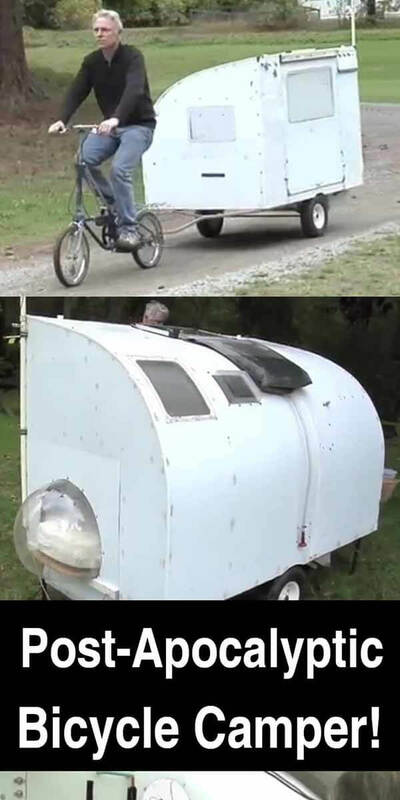 Youtube creator, Paul Elkins, put together what he calls his post-apocalyptic bicycle camper / bug out vehicle. Obviously, this wouldn’t work if you have a group or a family, but if you plan to go it alone after the SHTF and there is no gas or working vehicles, this might be your best bet. As you can see in the video, it’s light enough to pull behind you on a bicycle, yet it’s large enough for you stay out of the elements, relax, eat a meal, and even get some sleep. There are plenty of storage bins, a table, a mirror, a fan, a counter, a butane stove, and even a pee jug. You can view his tour of the bicycle camper below. Great little invention … but you would be pretty limited as to where you can pitch up for the night !! I mean, taking this into deep forest / woodland isn’t an option I don’t think.